When studying the Amazon of Ecuador in the 1980s, world famous botanist, Dr. Gentry, discovered the greatest number of plant species per hectare in the world, which made Ecuador the country with the highest biodiversity in the world. In fact, a United Nations team - including Dr. Daan Vreugdenhil, aca the "Parks Man Daan - selected 39 national parks and reserves (see here the original report in Spanish: United Nations Study by the FAO). As there was no information on ecosystem and hardly any information on species distribution, we used criteria such as distribution of virgin forests and elevation levels, hoping to compose a representative protected areas system. Dr. Gentry's research and studies of many other biologists since then, confirmed that we did it right. In the course of the years, the protected areas system grew to include even more ecosystems and species, now protecting 51 areas covering almost 20% of the territory of Ecuador. Spread across the country, these areas are found in totally different climate zones and elevations, protecting breathtaking landscapes, fascinating wildlife, cloud forests in the Andes, rainforests in the Amazon, and at the coast, mangroves and cactus-clad dry forests. The National Parks System of Ecuador has 51 protected areas of different categories. Check our scoring table for beauty, access & wildlife. Visitation of protected areas 2006 - 2010. Welcome to NATIONAL PARKS WORLDWIDE with the national parks, nature reserves and other protected areas of all countries of the world. National parks are the prime locations of wild and untamed nature; in many countries they are the most exiting places to visit, if you can find them. This website is your first help for getting to the national parks of Ecuador. Hallo, welcome to our Ecuador program. Let me tell something that no travel agent will never tell you. Why? Very simple, because they have no idea, because no travel agent in Ecuador knows more than 3 or 4 parks in the country, other than Galapagos. That is why the "Parks Man", who was part of the selection team, designed a national parks tour for Ecuador, highlighting a great representation of the Andean and Coastal parks. This program can be complemented by a Galapagos and an Amazon module. Your visit is essential for the conservation of the parks and reserves of Ecuador. For combined packages, we can offer special prices. To make a selection to which areas you may want to visite, we gave a scoring to the areas, so that you may have an idea what could be important areas for you to visit. The scoring is from 1 - 5; the latter being very good, while comparing between these areas in Ecuador, in order to distinguish among them. While most areas are scenic, some stand out for dramatic landscapes that are not found as abundantly in the other areas. All areas with snow-caped mountains have scored high. Tropical low-land areas score high if there are lakes from where birds and other wildlife can be watched. Access scores a 5 if there is very convenient road-access to good trails or well-organized access over water that can be easily contracted. Ecological importance is based on worldwide rarity of the ecosystem and/or species diversity. Overnight facilities score high if in or very nearby the port of access of an area lodging is available, within an hour's ride. After the scoring system, we present a tour which allows you to visit a representative selection of the many areas in the protected areas system. The extremely rare subspecies are bred in a breeding station at the Darwin biological station. Young tortoises are kept in different cages for each subspecies. After they have grown large enough to have a high survival chance, they are released in the wild on their corresponding island. Many of the areas are only hours away from Ecuador's main cities, and yet.......... very few of those jewels of nature are ever visited. World traveler of 80+ countries and renowned national parks adviser of the World Bank and United Nations, Dr. Daan Vreugdenhil, developed the �ECUADOR NATIONAL PARKS TOUR� which takes you to 8 protected areas in 9 days. 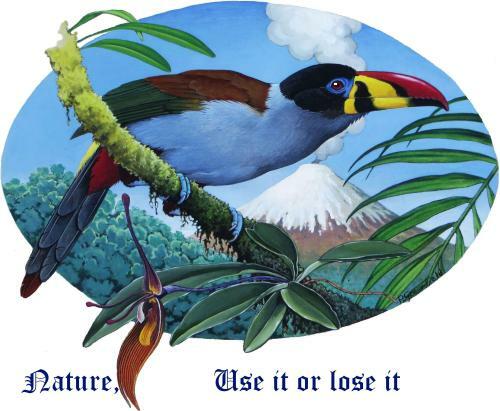 Having been part of the United Nations team that selected the majority of the protected areas of Ecuador between 1974 and 1976, nobody knows the ecology and protected areas system of Ecuador better than Dr. Daan Vreugdenhil, aca the "Parks Man Daan". In fact, the National Parks Tour takes you to all cultural highlights of the country - Otavalo, Guayaquil, Cuenca and Ingapirca - while at the same taking you on a journey of discovery of a fabulous representation of all major ecosystems of the Andes and the Coast. We also left out a visit to the highest and most beautiful capital of the Americas, Quito, as there is enough opportunity to see it between modules. So, when combining all three modules, one gets a selection of most ecosystems of the entire continent of South America as well as all cultural mayor highlights of Ecuador! Our National Parks tours have been designed to complement existing national parks programs to Galapagos and/or Amazon national parks, like Cuyabeno and Yasun�. They can start from different places, particularly Quito, Guayaquil and Cuenca. While the full program lasts as many as 9 days, it is possible to make a limited selection of parks. For instance, a 6 days' module "Andes and Coast" from Quito. 5-6 days' modules are available from Cuenca and Guyaquil. According to your wishes, these modules can be be combined with your Galapagos and/or Amazon program(s). IF you buy our national parks module together with a Galapagos and/or Cuyabeno module from us, we can give you significant discounts. Get to the highest point on earth where you can get by car and enjoy the roughest landscape. Either enjoy outside or from the shelter while enjoying a hot drink. The Chimborazo Volcano also is the highest point on earth to see vicu�as, as they roam past 5000 m into the snow. For those who want to complete their Ecuador visit with a guided tour to Lima, Cusco and Machu Picchu, we even offer a 5 � 7 days module, with which you get the most spectacular highlights of nature and culture of South America in one epic journey! We first present the full tour, while at the end of the page you get several modular options on how to break it up into shorter modules. Famous Inca stones wall in Cusco. Quichua Indian girls in traditional dresses.